10 Great Father’s Day Gifts ! Father’s Day is around the corner and it’s time to show our Father’s we care. Dad is always silent and strong, his feelings may not be expressed in words but they are definitely expressed in deeds. 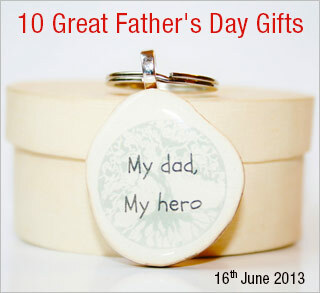 We have mentioned 10 great Father’s Day gift ideas to make it easier for you to shop. Leather Gifts: Leather gifts make a perfect gift for men. Whether you consider buying a wallet, laptop bag, office bag or portfolio bag ! You cannot go wrong in here. So keep an eye on what your Dad needs this year and consider replacing his leather item with a new one. Perfumes : Gift Dad his favorite perfume and nothing like it. If he is not particular , you can always gift him a nice cologne or a famous branded perfume that’s most popular in the market. Watches: A silver watch with a midnight blue dial or gold strap watch with a black dial make a killer combination . Gift Dad a watch that will add a classy touch to his personality. Gift Certificates: If you are not sure of what Dad wants, you can always get him a gift certificate from his favorite store and he can shop when he feels like. You could also gift him a voucher to his favorite restaurant and do a special arrangement for him before he arrives there. Health & Personal Care: Health monitors and health enhancer products will help keep a track on his health issues and help him take care. Personal care products like grooming kits are also very useful for men in day to day life. Gift Hampers: Gifts hampers are the easiest way of gifting. Customized gourmet hampers with wine and other sweets make a great gift. Cakes : A special Fathers day cake of his favorite flavour and from his favorite cake shop . Nothing better than this to surprise him on Father’s Day . Stationery: Stationery items for his office desk or a personal diary, memo pad and a travel book will surely make him happy. Quirky Gifts : These are considered as unique gifts such as a Best Dad mug or a cute show piece illustrating a Father’s Day quote. Personalized Gifts : Add a personalized touch to gifting and show Dad how much you care. Take a picture of you and him , frame It or get it printed on clocks, mugs, pillows or just create an album of your journey from birth till now with him.